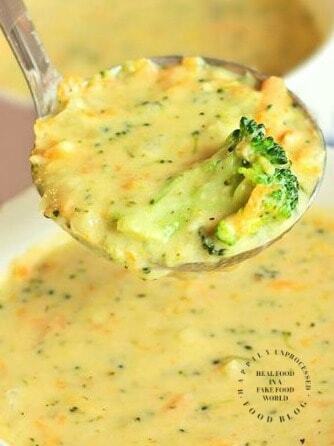 If you’ve ever had Panera’s Broccoli and Cheddar soup then you know how deliciously additive it can be. As far as franchise based soups, this soup really isn’t horrible for you. But when you are watching carbs or eating very low carb (even keto) you want to keep these carbs as low as possible. Panera’s soup has 20 grams of carbs in a cup of soup. Some of that comes from the broccoli itself along with the flour to thicken it, but still it’s more carbs than I eat in a day now. So let’s make a few changes. I went back and forth with whether to label this Keto friendly or not b/c this recipe does have a Tablespoon of flour in it. Is 1 Tablespoon enough to kill this as a keto recipe? I’ll wait for you guys to let me know. I guess you could leave the flour out or I’m open to alternative flour suggestions if any of you have tried them in this type of soup. Either way, it still is something I eat for lunch with a protein along side. The ratio is 86% Fat, 6.3% Carbs, 8% Protein in case you are counting macros. Low carb and keto aside, this soup is just amazing. It has very few ingredients. The onion and carrot soften and become translucent and garlic (of course!) is added. Slowly add the broth, cream, cheese and finally the broccoli and the soup is done. Make sure the soup is not HOT HOT, have it on a low heat or better yet take it OFF the heat when adding the cheese. Adding TOO MUCH cheese at once. Put in a 1/4 cup at a time, stir it around. It doesn’t take long to melt and then keep adding it until it’s all incorporated. Begin by melting the butter in a large saucepan over medium heat. Add the onions and carrots and saute until they soften – approx. 3-4 min. Season with a little salt and pepper as they cook. Add the garlic and saute another 30 seconds or until fragrant. Add the flour and whisk for 30 seconds – 1 minute. Slowly add the warmed chicken broth and water allowing the soup come to a boil. Turn the stove down to low or even take it off the heat entirely when adding the cream. Stir to incorporate. Add the cream cheese and slowly add the cheddar cheese about 1/4 cup at a time, ensuring it has completely melted before adding any more. Add the broccoli and taste for seasonings. Let the soup simmer 10 min or until broccoli softens. 0 Response to "Broccoli & Cheddar Cheese Soup (Keto Friendly)"